"Today, I presented Ontario's position on the national security investigation of imports of automobiles and automotive parts at the U.S. Department of Commerce's public hearing. I travelled to Washington to stand up for Ontario's auto industry, businesses, and workers. I made it clear at today's hearing that we must keep the automotive industry and its workers — on both sides of the border — top of mind in our decisions. Workers are the backbone of our integrated auto sector. The imposition of trade measures, such as tariffs, would disrupt the sector, lead to significant negative economic impacts, and threaten job losses for the industry in both Ontario and the United States. While in Washington, I also took the opportunity to meet with U.S. government officials and key auto sector representatives to reinforce that Ontario is Open for Business. The jobs created through trade — jobs that support families and businesses — rely on our open border. I am committed to working with the Government of Canada, Ontario businesses and Ontario's U.S. partners, to advance our shared priorities of protecting and creating jobs and supporting a business environment that spurs innovation and growth. I will continue to vigorously defend and advance Ontario's economic interests at home and abroad." 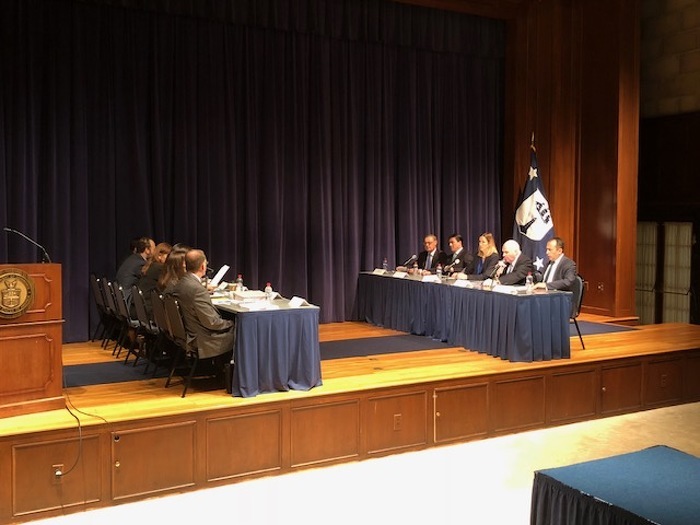 Minister Jim Wilson presenting Ontario’s position on the national security investigation of imports of automobiles and automotive parts at the U.S. Department of Commerce’s public hearing.